It seems that Sprint is not having much luck with timing when it comes to the announcement of its 4G strategy. Back in March it was apparently poised to announce a deal with LightSquared at CTIA, which was derailed by the AT&T/T-Mobile merger announcement. Now Sprint has just sent out invitations to its October 7 strategy update, only for the DoJ to announce it is filing suit to block the merger. As Sprint attempts to write the “fourth chapter” in its 4G strategy for this October event, it appears the upheaval caused by this unexpected DoJ announcement could very well complicate its plans. It has been reported that Sprint has engaged in discussions with several cable companies, but most coverage had focused on whether this would lead to a takeover bid for Clearwire. However, there isn’t much need for a resolution of the Clearwire situation ahead of October 7 – what Sprint really requires is a solution for its wide area LTE coverage rollout rather than the urban capacity enhancement that Clearwire intends to provide. With little probability that it can use LightSquared’s spectrum in the immediate future, and only a limited quantity of its own PCS spectrum available for LTE, I think its more likely that the next chapter of Sprint’s strategy would have involved the cable operators exchanging their SpectrumCo AWS holdings (a near national 20MHz block acquired for only $0.43/MHzPOP in the 2006 auction) for an equity stake in Sprint itself. Now the DoJ’s actions this morning have introduced considerable uncertainty about whether this would be the best way forward for Sprint, both because a Sprint/T-Mobile merger could ultimately be back on the table, and because the cable companies could potentially sell their AWS holdings to T-Mobile, which was previously regarded as the obvious purchaser for these assets. Thus I think on balance its now less likely that Sprint will have a major new agreement with the cable companies to announce in October. There could also be repercussions for DISH’s filing with the FCC for a waiver of the ATC restrictions in the 2GHz band. There are certainly many positives, in that either T-Mobile or AT&T could once more become a viable partner for DISH, but it also seems likely that the FCC may be unwilling to decide how it will handle the DISH application (and more particularly what conditions it will agree to) until the ultimate disposition of the AT&T/T-Mobile merger is decided. That’s because there will be less need to insist on DISH becoming a standalone competitor (and perhaps even to provide wholesale access commitments) if there are still going to be four national wireless operators in the market, though of course the FCC will still want to ensure that DISH does not simply flip the spectrum to one of those “big guys”, as some people apparently think it will do. One of the most puzzling aspects of Inmarsat’s Q2 results was the revelation that while it has now activated over 30K ISatPhone Pro handsets (as of early August), and sold at least 15K handsets to distributors during the second quarter, land voice revenue in the quarter was only $3.3M, down 17.5% on the corresponding period in 2010. 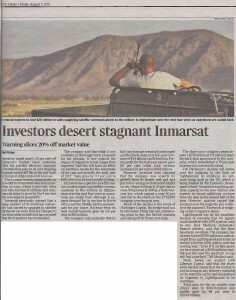 While the decline in overall revenue appears to be largely due to reduced BGAN voice usage in Afghanistan, service revenues from the ISatPhone Pro still appear to be pretty minimal, presumably less than $1M in the quarter, and Inmarsat admitted that the revenue “is still lagging where we would like it to be”. I’m told that the reason for this discrepancy is that Inmarsat has sold nearly 10,000 phones in China over the last year, which come pre-activated with a 10 minute prepaid card, valid for 2 years. That explains why Inmarsat is now claiming to have achieved a one third share of new activations, although it still appears to be trailing Iridium in overall handset sales (Iridium added 17K net new commercial voice subscribers in the second quarter). Of course, the booked service revenue from these ISatPhone Pro sales in China is well under $1 per month, which clearly has a dramatic impact on Inmarsat’s overall handheld ARPU. 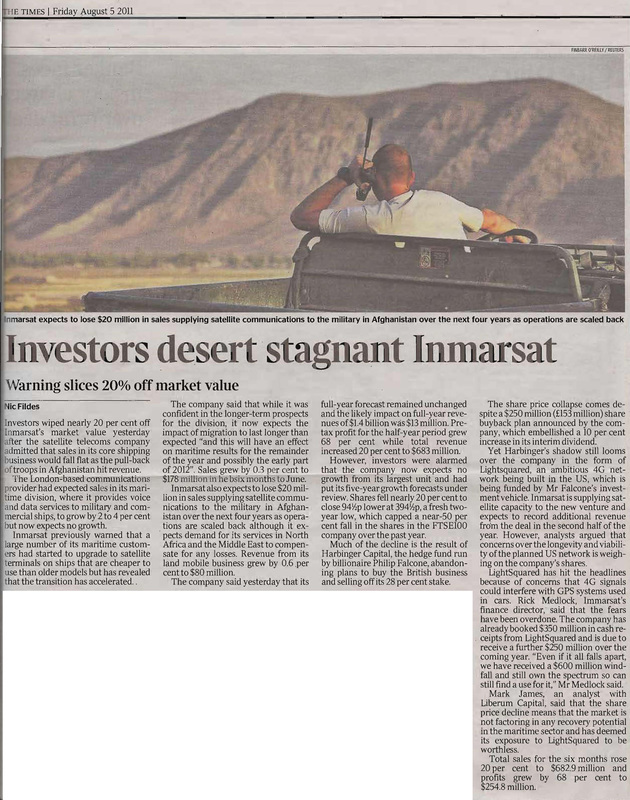 As a result, if the Chinese market continues to be a major driver of sales for the ISatPhone Pro, it will make it even harder for Inmarsat to come close to gaining 10% of the handheld market in revenue terms by the end of 2012. Indeed the challenge that Inmarsat faces in “break[ing] into the heavy-spending larger customers where there is a long-established provider in place” is amply demonstrated by the fact that apparently journalists don’t even know what an ISatPhone Pro handset looks like. However, because of LightSquared’s prior assurances that it wanted to cooperate with the GPS industry to preserve existing services, no-one seems to have noticed that in fact the company does have a potential “nuclear option”, namely that because these services are provided on a commercial basis to Starfire and OmniSTAR, LightSquared and Inmarsat could simply decide to cease supporting these services in accordance with their capacity lease contracts. Given that LightSquared is now blaming the GPS industry for the interference problems and accusing GPS manufacturers of being unwilling to cooperate with its attempts to find a solution, it seems increasingly plausible that LightSquared could now say that it simply can’t continue to support these services unless the FCC mandates a rapid transition of precision GPS users to new equipment equipped with filters. LightSquared (which provides capacity to OmniSTAR, now owned by Trimble) has previously indicated that it only plans to support its legacy services in “emulation mode” for a limited period of time, and it appears likely that the contract with OmniSTAR could therefore potentially be terminated at relatively short notice. While Inmarsat’s contract with Starfire may not operate under quite such a short time horizons, many of Inmarsat’s leases are renewable on an annual basis and so could possibly be terminated if desired. In reaching such a decision, Inmarsat would have to decide whether it prefers the ~$1M or so it receives each year from Starfire to the $115M it is being paid each year by LightSquared (indeed it is conceivable that this issue may have been addressed in the deal under which Inmarsat was paid an additional $40M by LightSquared earlier this year). As an aside, LightSquared does not seem to be the only MSS operator whose ATC services face interference challenges. A recent comment on one of my older blog posts highlighted that Open Range has been getting into difficulties with its use of Globalstar’s S-band spectrum in Indiana. Additionally, if LightSquared’s use of ATC handsets at 1627-1637MHz is a major concern for GPS users in the 1559-1610MHz band, then one would have to expect even greater concern about any future ATC deployment within Globalstar’s L-band spectrum at 1610-1617.775MHz (note that Open Range only uses Globalstar’s S-band spectrum in a TDD architecture). Similarly, there are now a number of comments in the 2GHz proceeding about the potential interference challenges at the bottom end of the TerreStar uplink spectrum (2000MHz). Throw ‘em under the bus? Judging from these comments, my best guess is that there will now be six more months of testing on the lower band proposal (lasting into the spring or early summer of 2012, depending on how long it takes to issue the ruling), and a final decision could plausibly be deferred until after next year’s Presidential election (in order to avoid a political battle with the farming lobby). In addition, I suspect that even if LightSquared (assuming it is still around) received approval at that time, there could still be a delay of several years for precision users such as farmers and surveyors to modify their equipment before the lower band was brought into use. On the other hand, this morning, DISH stated that it plans “to make a mobile broadband play with its recently acquired S-Band satellite spectrum” and it intends to play a “significant role” in the wireless industry. When asked if DISH would reveal its strategy as soon as the Sprint announcement on October 7, DISH cautioned that they “wouldn’t expect anything in the near term.” Thus it seems that with LightSquared now left hanging, and the stock prices of Sprint, MetroPCS and Leap all suffering badly after their Q2 results, DISH is in an increasingly strong position, and may want to take more time to obtain the best possible terms for the partnerships needed for its wireless strategy. However, if that is the case, it is harder to see what might be a plausible “fourth chapter” for Sprint’s wireless strategy in early October, and it is always possible that DISH’s comment could be intended to put pressure on Sprint to offer them a better deal.